Note: Ice cream is optional. Adding Ice cream adds more taste to milkshake. Put 1 scoop of ice cream on top. Mango Milkshake is ready to serve. Mango shake looks so delicious and comforting. Excellent drink. What a wonderful way to cool off in this summer... mango milkshake looks super delicious:) yummy..
My favorite summer drink :) Mango milkshakes - nothing can beat them! Mango milk shake is perfect for scorching sun. Refreshing and healthy milkshake.. looks awesome !! Slurp and YUM and more yum :) perfect summer post! You have a yummy drink ready. 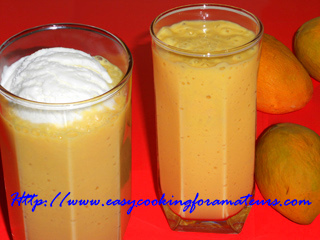 Mangoes being my fav., I used them to make this yummy milkshake. Your mango milk shake also sounds gorgeous.